Super B™ is a comprehensive vitamin complex containing eight essential and energy-boosting B vitamins: B1, B2, B3, B5, B6, B7, B9, and B12. 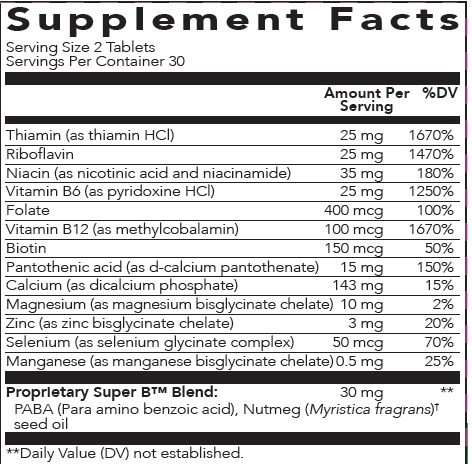 The complete B-vitamin profile in Super B not only assists in maintaining healthy energy levels, but it also supports the nervous system, aids in maintaining normal cardiovascular function, and helps with internal enzyme reactions. * With the new addition of B5, Super B now also assists with mood support.